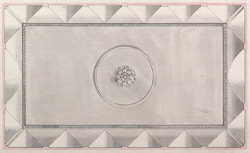 Plan of ceiling of St Mary's church in Ealing with decorative mouldings. This medieval parish church was rebuilt in 1735/40 by J Horne. A typical Georgian classical church, it was however much changed by a 1866/74 restoration and enlargement by SS Teulon, so much so that people commented that it had come to resemble a "Constantinopolitan basilica".